We have the heart and mind to solve your problems. The mission of Tolbert & Tolbert is to honor God by rendering compassionate litigation services to businesses, organizations and individuals. 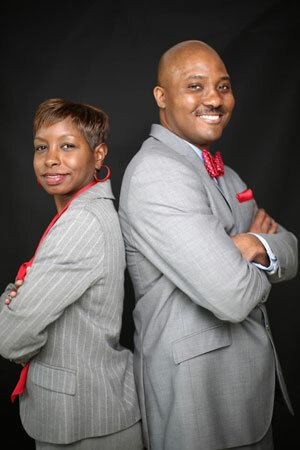 Partners Michael and Shelice Tolbert had one goal in mind when forming the law firm of Tolbert & Tolbert LLC- to create a faith based law firm built on Christian principles and to provide the best, most affordable legal services to businesses and individuals. Michael and Shelice were married in 2006 and met as kids in Gary, Indiana in 1987. As children, both dreamed of one day starting a law firm in their hometown. Tolbert & Tolbert LLC was launched on January 26, 2015, and a new way to deliver legal services was born. Michael and Shelice acquired exceptional skills to handle complex legal matters in representing a broad range of clients. They are routinely hired by large insurance companies to handle very serious insurance claims brought by or against policy holders. Because of their religious beliefs, their approach to analyzing legal problems and the counseling of clients is focused on solutions and not dominated by the billable hour. The focus on fairness in not only the fee structure presented to clients, but on efficiently addressing the legal problem, is very important to Tolbert & Tolbert. Because of this approach, the lawyers of Tolbert & Tolbert have provided legal counsel in negotiations, contract disputes between businesses, and have been retained by grieving families who desire to bring wrongful death claims. The attorneys have also been routinely selected as counsel for many non-profit organizations. The lawyers at Tolbert & Tolbert have experience in providing pre-lawsuit counseling to clients but can also handle a case through trial if necessary. The attorneys have represented both defendants and plaintiffs in a variety of cases which provides them with a more in depth view of the legal problems presented by clients. This allows Tolbert & Tolbert the ability to explore many options that would be beneficial to the client. If you look closely at the ampersand symbol in our logo, it is a heart. Tolbert & Tolbert desires to honor God with each client representation by providing quality legal services with compassion. Whether it is high stakes litigation or business counseling, let Tolbert & Tolbert service your legal needs. Disclaimer: Thank you for visiting the web site of Tolbert & Tolbert LLC. Please be advised that our Web site exists for informational and advertising purposes only. The information you obtain at this site is not, nor is it intended to be, legal advice. Please seek legal advice from a licensed attorney in your state. We have provided ways to contact us, such as email and telephone, however, contacting us does not create an attorney client relationship, as we must also accept representation before the attorney client relationship exists. Please, therefore, withhold confidential information until such a relationship exists. We also attempt to keep all information on this site current, however, the information or law may have changed, and this site does reflect the most current information.